I am definitely late to the party but, I finally got my hands on ColourPop’s new pressed shadow pans. I actually got the Valentine’s Day Collection singles; which are super cute! I believe they were originally packaged as duos but released as singles because they sold out so quickly. I ended up ordering 4 shadows and I received an empty palette for free! I didn’t want to go overboard with ordering a bunch because I wasn’t sure if I was gonna like the the formula. 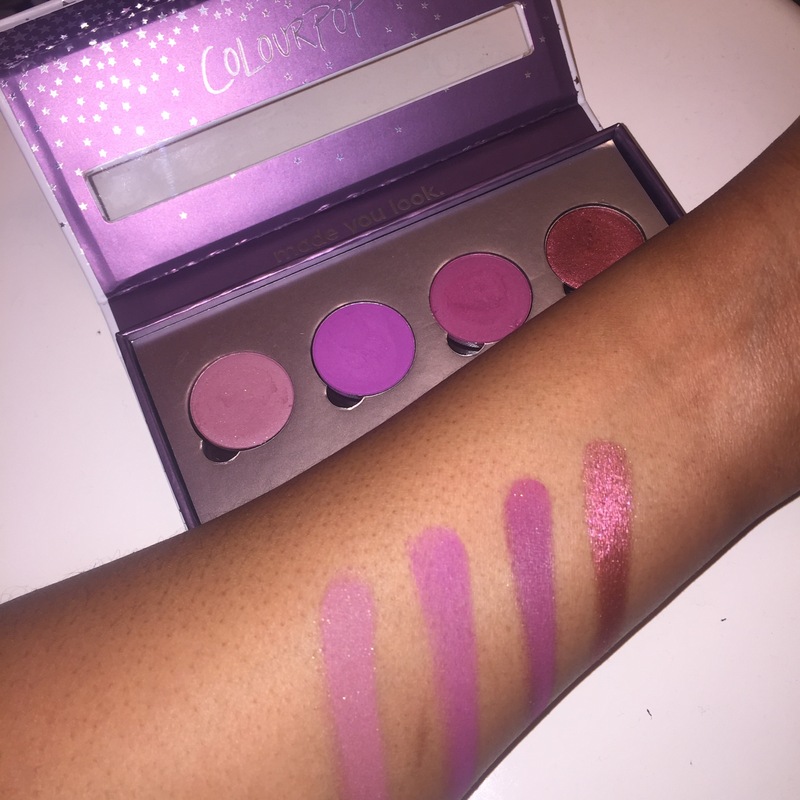 I happen to like ColourPop’s original eyeshadows (Super Shock Shadows) and after one use of the new pressed shadows I’m addicted. They swatch amazingly and are so easy to work with on the eyes. The pigmentation is definitely there and they blend out like a dream! These shadows can be rather powdery but, there isn’t much fall out when applying to the eyes. Unlike the original formula you can apply these with a brush as well as your fingers. Also they can be placed in a magnetized palette which makes storing a million times easier. These shadows come in two different finishes-metallic and matte-and retail for $5.00 like most other products ColourPop offers. At this price how can you not give these a try? My current favorite is “Pinky Promise”; I like placing this color all over the lid for a pop of sultry fun. I plan on placing another order soon because I need more. If you’ve tried them let me know you thoughts in the comments down below. Left to right- Pretty Cruel, 143, Going Steady, and Pinky Promise.